As a CAT Award nominee, we thought it was high time for a return visit to accessory store Wrexham Motoring Supplies. 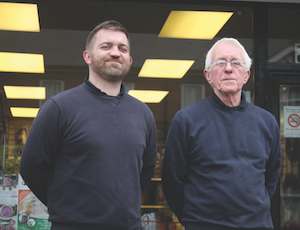 The third generation retailer will hit its 50th milestone next year as an independent supplying garages and ‘DIY mechanics’ in the town of Wrexham. Founder Arthur Jones established the shop in 1968 and kept it solely as a family-run entity that was later entrusted to his daughter Gaynor and son-in-law Alun Rogers after he died in 1971. Since then, Arthur’s grandson Jonathan now heads up the operation alongside his father. To say the father and son duo were shocked was an understatement after finding out they’d been shortlisted for the Retailer of the Year Award “We were surprised to say the least,” said Jonathan, “I even e-mailed the Editor to find out how we got nominated, but we were very thankful and humbled to have been considered for the award”. We felt the Rogers family did not give themselves enough credit for what seemed like a clean and tidy establishment stocking a number of well-known aftermarket brands with customers popping in and out for various items and the occasional chat during our visit. From Bosch wiper blades to Laser tools there were many accessory shop staples hanging up on display behind the counter for technicians and car enthusiasts alike. The middle of the store encompassed a range of low viscosity oils from Millers and Castrol, which were lined up in single file across the shelves; complemented with a variety of car care products and kits for extra road safety and vehicle maintenance. 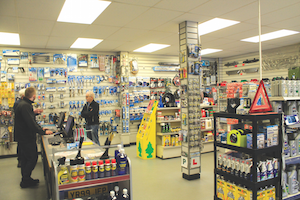 “Our fastest selling lines are brake pads, oils, bulbs and filters”, said Alun Rogers. “If someone comes in for a bulb or wiper, we will fit it for them because they’re not the easiest thing to fit, and won’t charge for fitment as we’ll hopefully see the customer return later”. Jonathan concurs, explaining that the driving force behind the retailer was going beyond customer expectations with a decent range and free fitting. “We bank on the personal side of the continual customer where most of them come back. Some wipers can take up to ten minutes to fit but we don’t charge for this because we want to help our customers.” he said, adding that the firm also responds to call-outs from garages and DIY enthusiasts for vehicles in need of a jump-start. Although competition is quite fierce in the area with the likes of ECP and CES just a short distance from the store, Jonathan reiterates the fact that customer service has been a key element to keeping the business afloat while standing out against the local competition. “Our main competitors around here are CES, Euro Car Parts and the LVW Group’s Rollings”, Jonathan continued: “Personal service makes us stand out and we still maintain an element of being a bit ‘old fashioned’ where we’re up-to-date with everything. We offer personal services, and customer satisfaction is our top priority, which is why we’re still here because we’ve become close friends with our customers”. More recently, the Rogers family have extended their product portfolio by supplying Wix Filters and introducing welding gas. Jonathan said the introduction of gas came into effect due to growing customer demand and no rental charges on the cylinders. Being a UAN member also has its perks allowing the firm to attain more ‘buying power’ from aftermarket brands at cheaper rates. Additionally, the membership offers seasonal promotions that the Rogers can take advantage off as and when required. The store’s website and Facebook channels has been a strong source for advertising and increasing its client Rolodex, as Jonathan points out. “We have a Facebook account and website which we are in the process of updating. We also do some local advertising at car rallies and the Wrexham Football Club”. For the near future, the team have no drastic expansion plans, apart from continuing Arthur’s legacy and growing their customer base with some more clients already coming onto the books in due course. We look forward to revisiting the Rogers Family for another brew in 2018.